During site excavation for the Broadstone West Dallas residential development, a number of antique bottles and pavers were unearthed. The development partner asked TPA to research the history of the bottles and to propose an elegant way to display them in the clubhouse. Our research led to discovering that the site’s location was once the heart of Freedmen’s Town, a vibrant black community in the 1920’s and now a National Historical District. The bottles were lit from below and displayed in custom-designed cases alongside historical photos from the era. The pavers were inserted under glass in the passageway connecting the bottle displays, accompanied by information about their manufacture and origin. 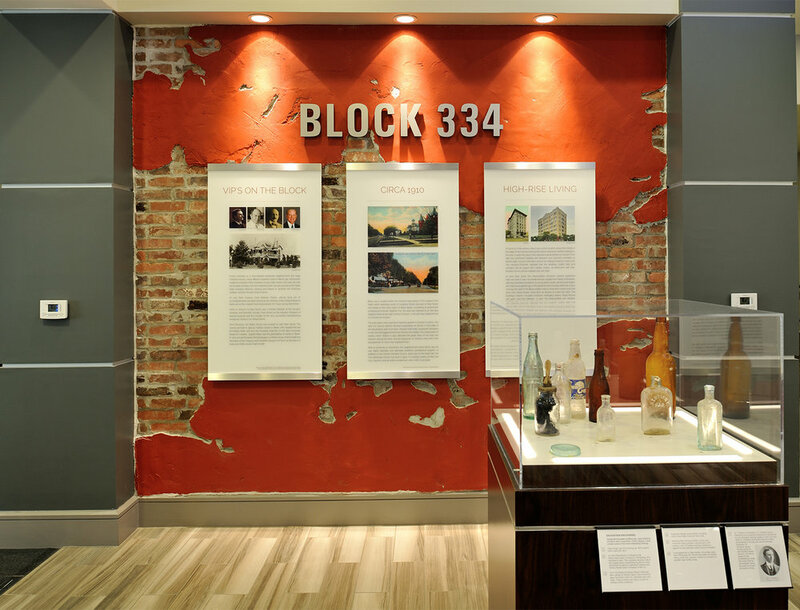 During excavation of the site on which Block 334 is built, in downtown Houston, several large architectural artifacts were unearthed, including a massive beam now on display in the community’s vestibule. 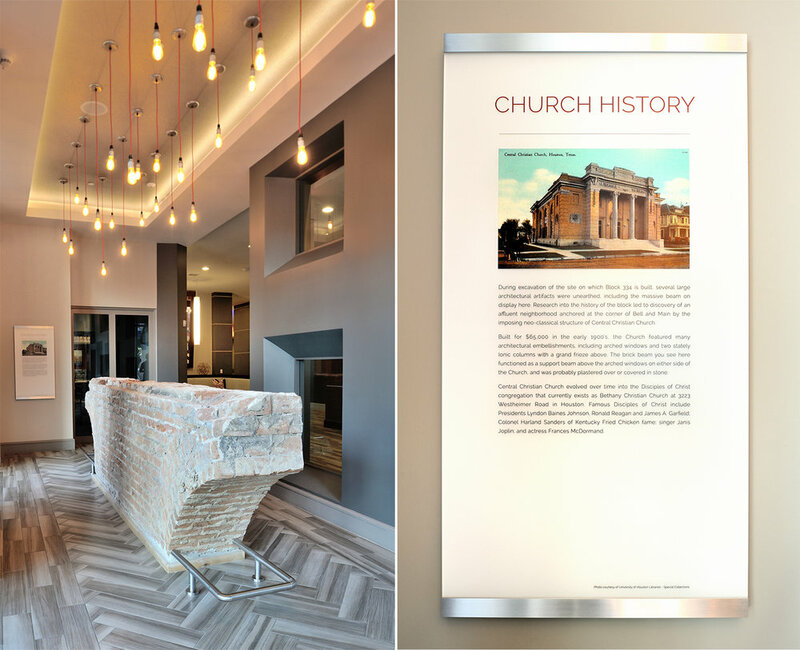 Research by TPA into the history of the block led to discovery of an elite, silk stocking district anchored by Central Christian Church from which the beam was recovered. The neighborhood was home to many Houston movers and shakers of the time, including the grandfather of James A. Baker, III. TPA also researched the history of multiple bottles found at the site. Significant specimens included Mrs. Winslow's Soothing Syrup, subsequently named by the American Medical Association as a "baby killer," and Dr. Tichenor's Antiseptic believed to be the first antiseptic used during surgery in the Civil War. Custom cases were designed by TPA to display the artifacts. Acrylic and aluminum graphics, hung on a faux brick and plaster wall, were created to tell the history of the affluent neighborhood. Nine gallery spaces are distributed throughout the two buildings that comprise 46 Penn Apartments. The developers decided to utilize these areas to tell the fascinating history of Country Club Plaza, located just one block from 46 Penn. Each gallery has a unique theme that describes an aspect of the Plaza’s history in words and images. The project involved working with a multitude of reference sources, including the Missouri Historical Society, the Kansas City Public Library, and the Kansas City Star newspaper, among others. 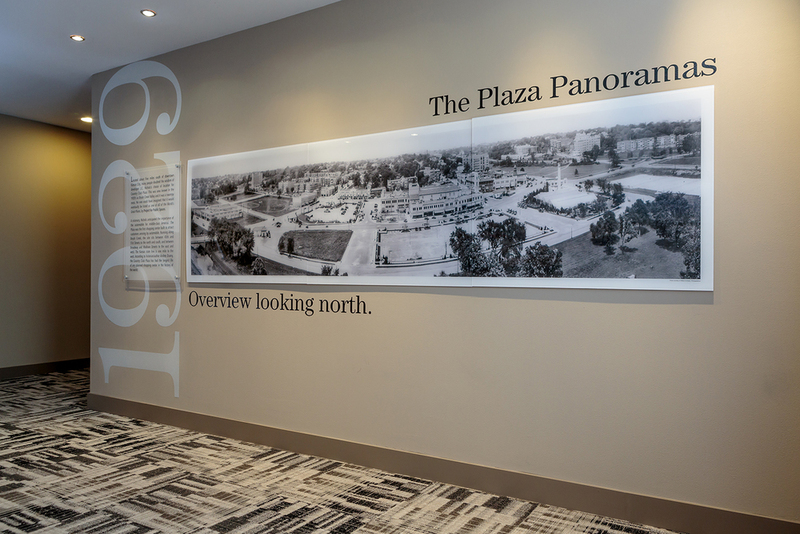 Some of the historical panoramas were printed up to 16 feet wide. Custom photography was utilized as well, most notably in the form of two stunning contemporary panoramas, which were used to contrast with historical panoramas from the early 1900's.